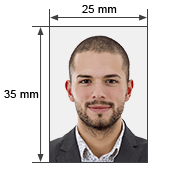 Size of photo: 2 x 2 inch, 35 x 45 mm or 35 x 35 mm (5 x 5 cm, 3.5 x 4.5 cm, 3.5 x 3.5 cm). Color of background: white or off-white. The model has to look towards the camera. Tilted head is not allowed. 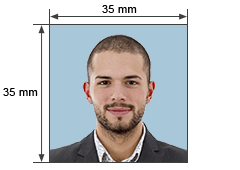 Profile or three quarter photo is not allowed. Indian OCI (Overseas Citizenship of India). Two ID photos must be enclosed for OCI application. Color of background: white is not allowed, usually light blue is used. Size of photo: 3.5 x 4.5 cm. Color of background: white or light coloured. Size of photo: 2.5 x 3.5 cm.